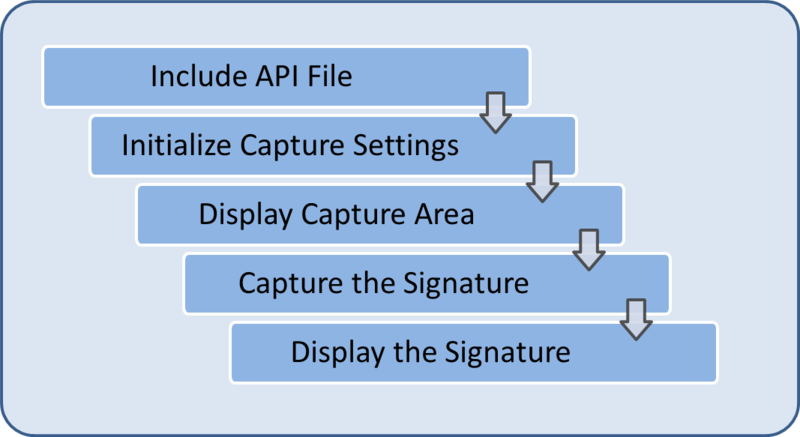 This tutorial covers the use of the Enterprise Browser Signature API for capturing signatures on touch screen devices. Enterprise Browser includes an API for capturing signatures. The steps shown below are typical for code that uses this API. The following tutorial will walk through creating a working example application using these steps. 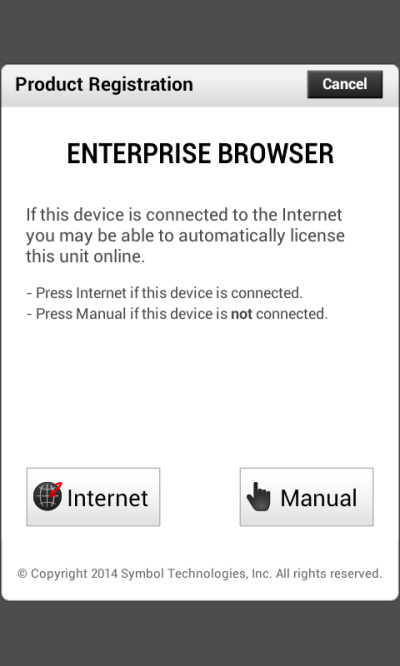 Home button that returns the user to the Enterprise Browser start page. Create a file named sigcap.html in your application directory and open it in a text editor. Open sigcap.html in a text editor. Add two input buttons to the controls div. The first button will be used to initiate signature capture the second will clear a captured signature. This method sets up and displays the capture area. The first few lines of code set parameters that will be used by the API. The settings disable automatic screen rotation for the duration of the capture, set the width of the line that users will draw with in the capture area, and set the background color for the capture area. Another way to initialize settings is to add them to a parameters hash. When the takeFullScreen() method is called, the settings passed in the parameter hash are applied before the capture area is displayed. The code above sets the outputFormat in the parameter hash so that the data returned from the capture includes the actual image data and not just a URI pointing to a stored file. The last parameter sent to the takeFullScreen() method is the callback method onSigCapture(), and is used to process the captured data. It will be created in a later step. In our demo application, the takeFullScreen() method will open a capture area that includes three buttons: Cancel, Clear and Capture. The Capture button when pressed will trigger the capture of the signature and the execution of the callback function. An alternate method, show(), allows you to designate a specific location on the existing screen as a capture area. When using show() you'll have to provide your own Cancel, Clear and Capture buttons. In that case your Capture button also must execute code that includes the capture() method to explicitly capture the signature. For more details on using show() and capture(), please refer to the Enterprise Browser API documentation. This method will be called by the Clear Signature button to reset the signature display area. Create a directory on your device for the Signature application. Make sure the directory is in an unrestricted location to avoid any permissions issues when Enterprise Browser tries to open the files. We'll place our sample app's files in the device's root directory and show you how to modify the config.xml file accordingly. Update the StartPage setting in config.xml to point to the location on the device where you placed signature.html and save the changes. Click on the Capture Signature button to open the capture area. Use your finger to draw a signature on the screen. 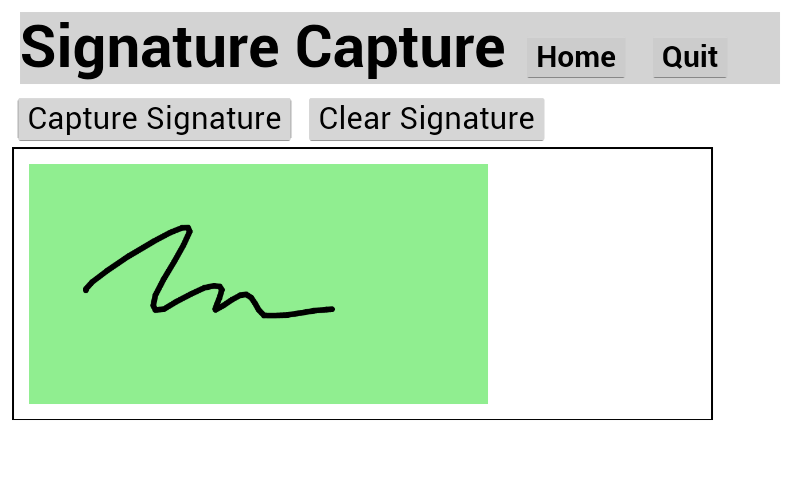 Click the checkmark-capture button to capture the signature and display the signature in the application. This completes the Enterprise Browser Signature API tutorial. For more information on the Signature API, please refer to the Enterprise Browser API documentation. 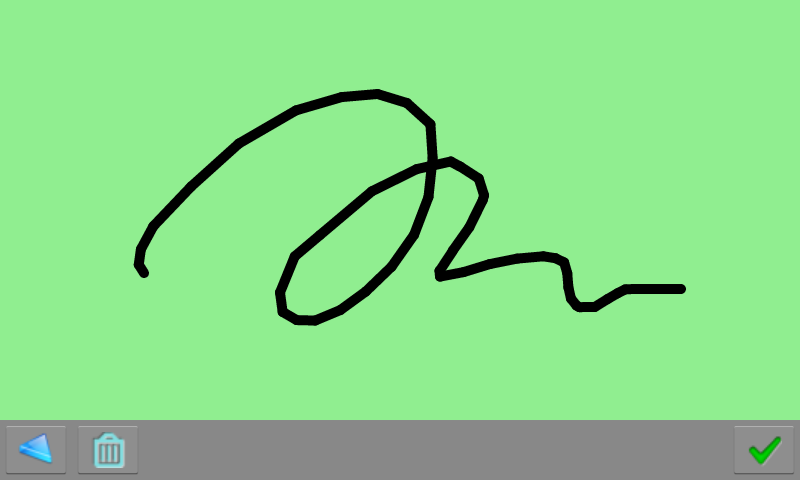 [a]This screen shows the app as it appears before a signature is captured. 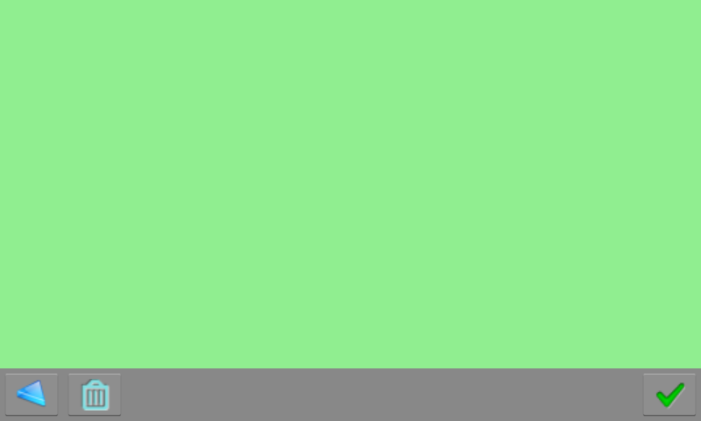 The empty img is populated in a later step by a signature image. alt text is provided in the img element. [c]Signature has been reset. This screen shows the app as it appears before a signature is captured. Alt text shows in place of empty image.